More than 15,000 Ulster rugby supporters are expected to travel to Dublin to watch their team play Leinster on Saturday, and one fan has started his journey already. The big occasion is the Heineken European Champions Cup quarter-final. Michael Dickson from Carrickfergus is walking to the match to raise money for injured rugby players. He left on Wednesday morning, and has set aside four days for the 110-mile cross-border trek. His route is from Ulster's Kingspan Stadium in Belfast via Banbridge and Castlebellingham, to Malahide and the Aviva stadium in south Dublin. 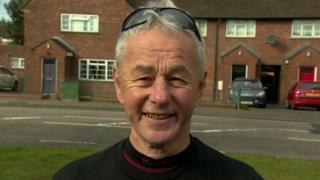 "I'm doing it the hard way," said Michael, 66, who is hoping to arrive just before kick-off. "The good thing is it'll be over by Saturday and then I've got the match to look forward to," he said. It is the first time in five years that Ulster has reached the quarter-finals of the competition. Ulster was officially allocated 13,000 tickets for the game, but more were put on open sale and an estimated 2,000 extra tickets were bought by Ulster fans. There were fears that cross-border travel could prove difficult this weekend with the planned date for the UK's exit from the European Union falling on Friday 29 March. However, with the Brexit timetable now slipping, no problems crossing the border are anticipated. Supporters are travelling to the game by bus, train, car and aeroplane. A fleet of buses has been hired by the official Ulster supporters' club. Extra cross-border rail services are being laid on, and fans based in England, Scotland and Wales are making their way to Dublin by air. One group of supporters based in Newry has hired an eight-seater taxi for the day. With so many Ulster fans due to descend on Dublin on Saturday afternoon, a special fan zone is being set up in the south of the city. Kick-off is at 17.45 local time. Michael Dickson is hoping to make it to the fan zone after his long walk. He is travelling light, with simply a small rucksack containing food, water, and, of course, his match ticket.